Jasmine Recovery Homes are designed to provide the most comprehensive support available for our clients as they reintegrate back into their lives. Our uniquely tailored locations are central to most public transportation and amenities, our staff are highly experienced, compassionate and supportive and our network of relationships and supports create a healing environment for our clients. We were hired to create an online platform for Jasmine Recovery Homes. The project required full branding development, an exciting and mobile optimized web design, integrating and managing social media networks, and user friendly CMS. The website was built with WordPress allowing Jasmine Recovery Homes team to easily manage their website content. We crafted exciting design to match Jasmine Recovery Home vision and location. 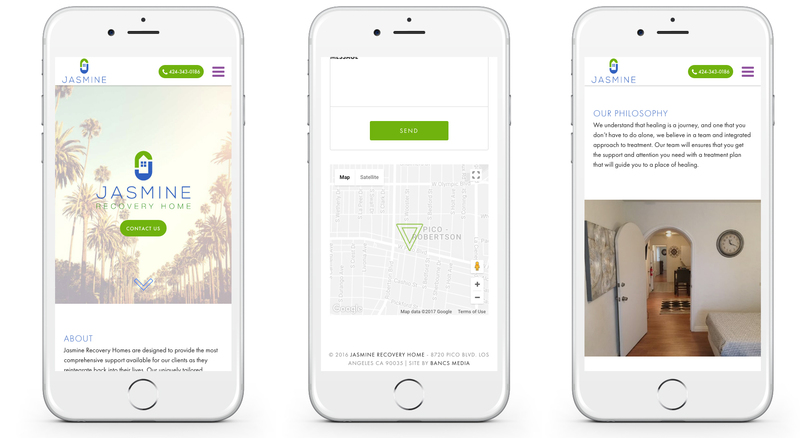 We designed the website with a mobile first approach which resulted in it being optimized across devices of any size, while still keeping Jasmine Recovery Home brand vision in captivating way.